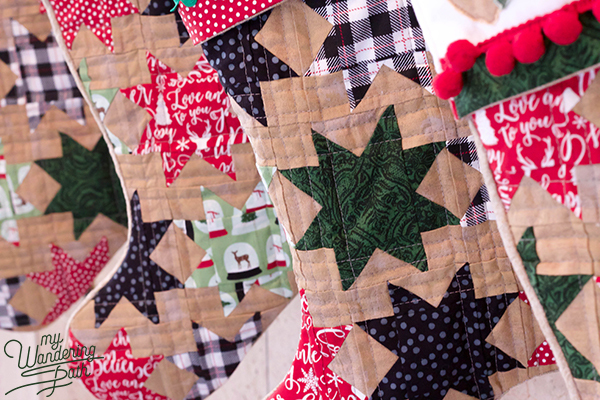 I am so excited to share my latest makes with y’all as part of Fort Worth Fabric Studio‘s Christmas Blitz blog hop! I just love the bundle of fabrics that I got to work with, and I know you’re going to love this bundle too! Put together, these fabrics have a great rustic vibe that I really wanted to showcase in my project. 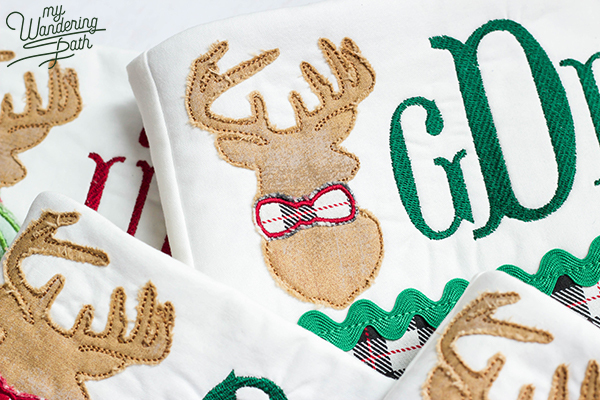 I also wanted an excuse to bust out my embroidery machine and do a little appliquéing and monogramming! 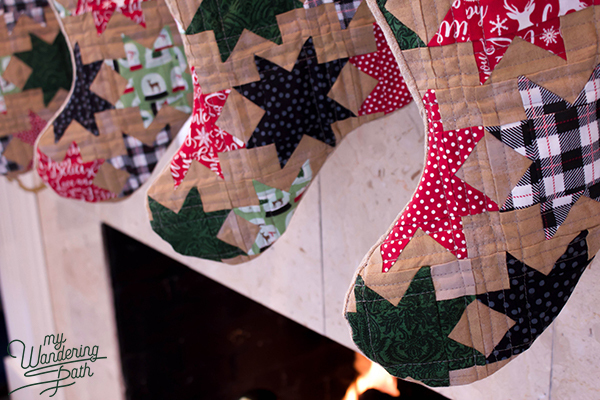 So I decided to stitch up some quilted Christmas stockings. 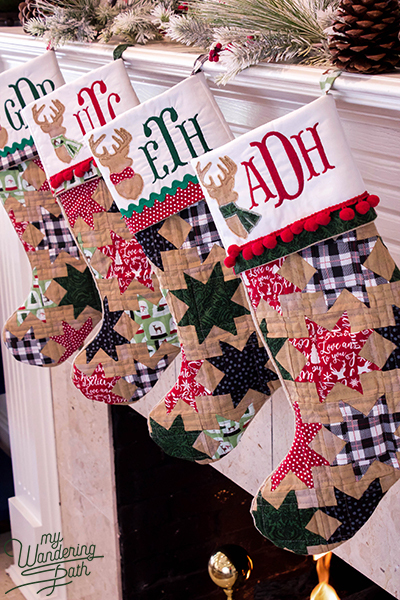 I have to say, I’m really proud of how these “Rustic Comfort” stockings turned out! My husband and kids love them too, which makes me even happier. Confession: they’re still hanging on my mantel from my photo shoot. The kids won’t let me take them down just yet! I couldn’t believe my luck when I saw the bundle of fabrics I was getting to work with. 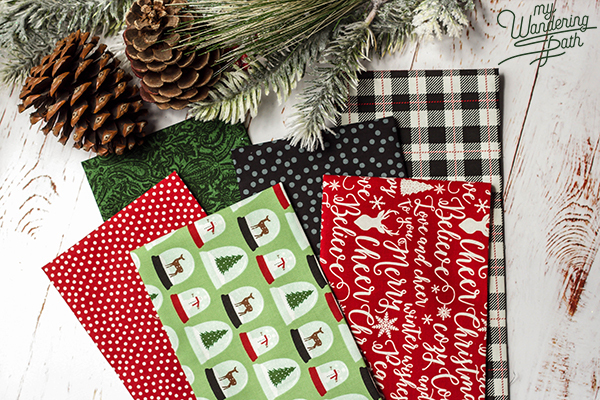 Riley Blake’s Comfort & Joy fabric collection had been on my stashbuilding wishlist, so I was thrilled to see several prints included in this awesome Deck the Halls bundle. 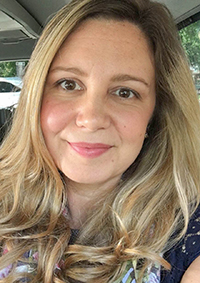 Lindsey from FWFS curated this bundle and included some great blenders that really complement the Comfort & Joy prints. 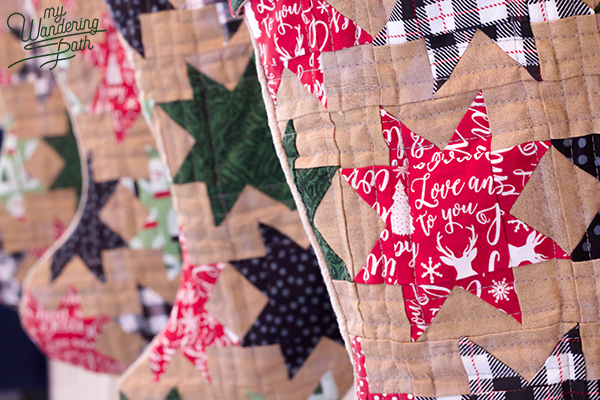 I poked around on Pinterest to gather a little inspiration (you can check out my inspiration board HERE) and ultimately decided to make sawtooth star blocks for the body of my stockings. I wanted to use a background fabric that played up the rustic vibe and went with a Moda Grunge Basic in Kraft. I absolutely LOVE this Kraft Grunge with the Deck the Halls bundle. I think they work perfectly together! 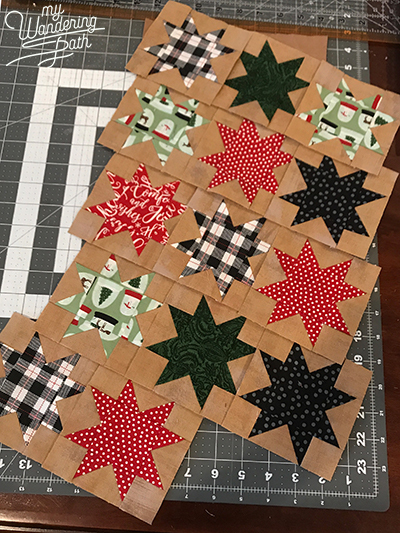 This was my first time making flying geese units and sawtooth star blocks, so I used Diary of a Quilter’s handy tutorial and cheat sheet for cutting and piecing all my fabric. 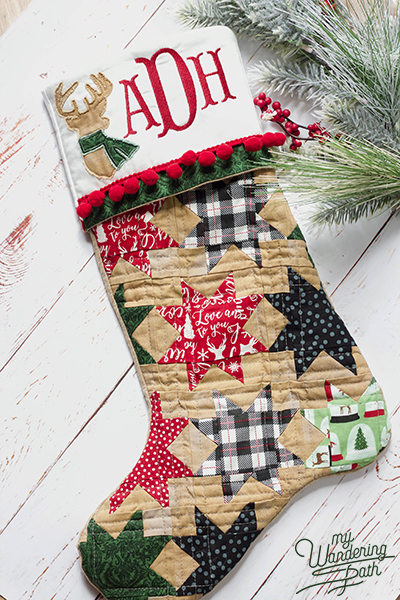 I went with the 4″ block size so I could get as many stars in my stocking as possible! 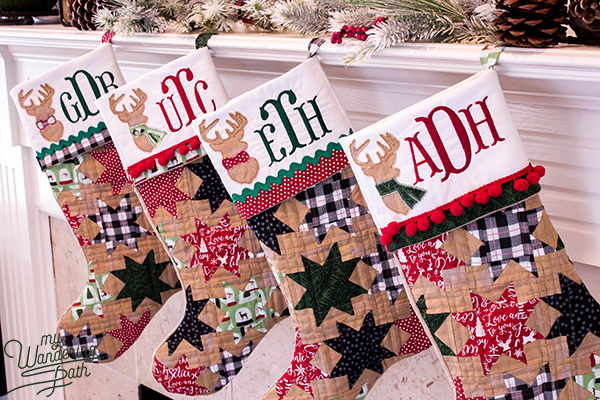 I wanted to do more than just a monogram on our stocking cuffs. 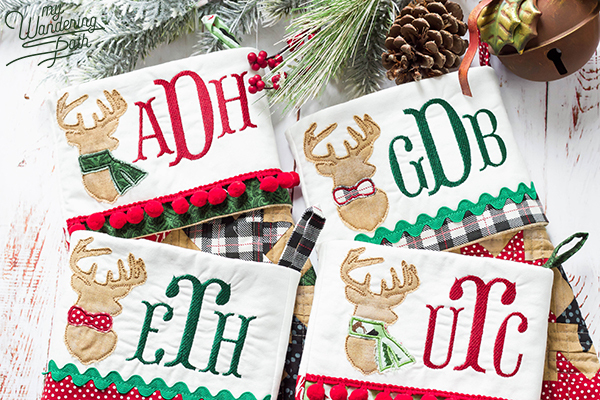 When I saw these reindeer appliqué patterns from Hang to Dry Appliqué Designs, I knew they were the perfect addition to our rustic Christmas stockings! I used the reindeer with a bowtie for my husband’s and son’s stockings, and my daughter and I got the reindeer with a scarf. I finished off the cuffs with a strip of fabric from the Deck the Halls bundle (I like to use every bit of fabric that I can!) and some fun trim–pom-poms and rickrack. For the back of the stockings, I used some Essex linen that I had on hand. I used plain muslin for the lining, and Cluck Cluck Sew’s superb tutorial for lining a stocking with a cuff. I don’t have a picture of it, but I took the time to overlock the interior seams of the stocking front and back; the lining; and the top seam that secures the stocking, cuff, and lining. There’s something so satisfying about a nicely overlocked seam, don’t you think? It’s tidy and worth the time for the extra stability, especially on a project that will get lots of use. 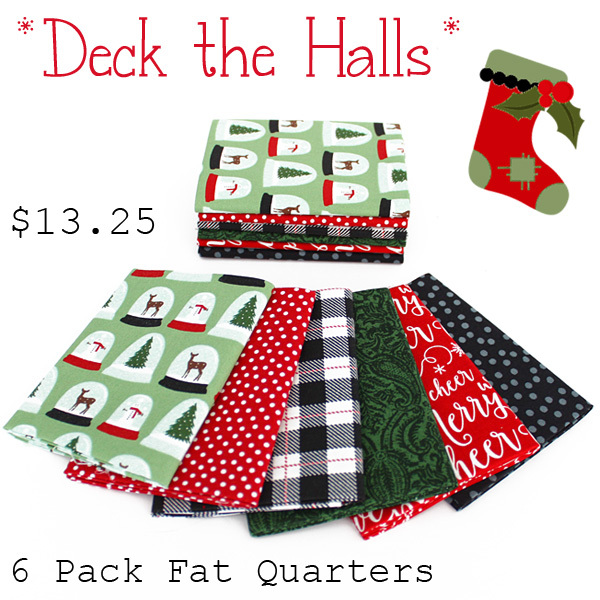 Be sure to head over to Fort Worth Fabric Studio to pick up a Deck the Halls bundle here before they sell out! It’s a steal! And you can find the Kraft Grunge here. Thank you so much for visiting my blog today! 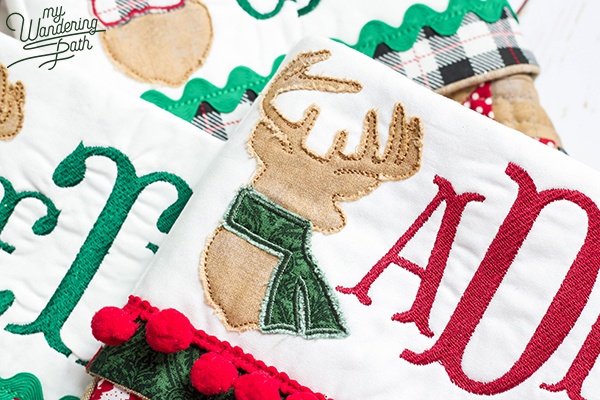 I hope you’re inspired to make something for the holidays with this fun bundle. And thanks again to Jodie and Lindsey at Fort Worth Fabric Studio for including me on the Christmas Blitz! This has been one of my favorite projects ever! 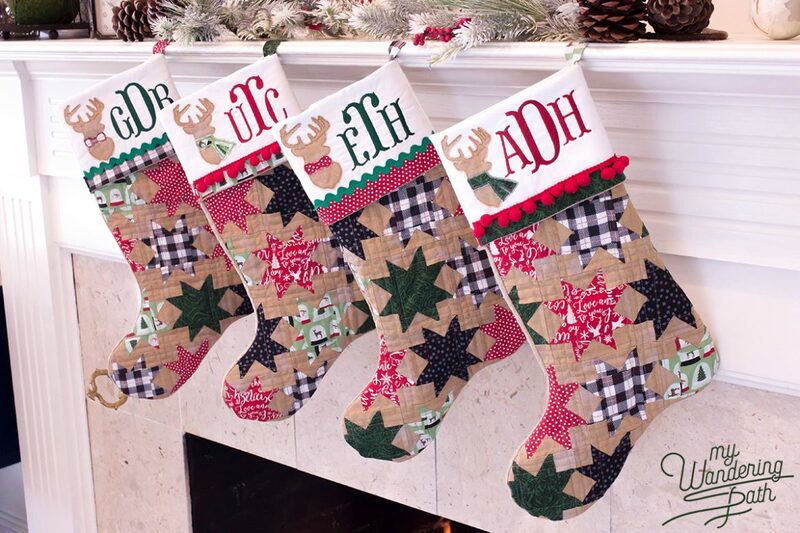 Y’all, I did not follow any kind of published pattern for these stockings. 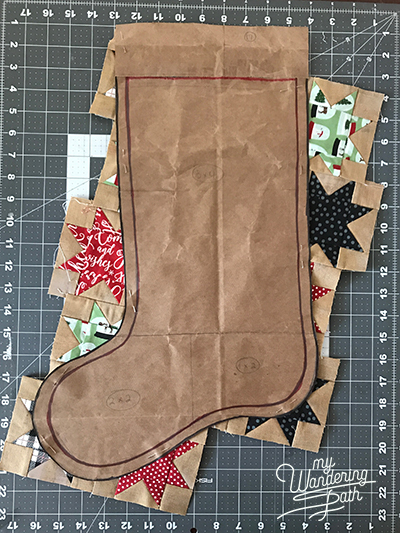 I freehand drew up a stocking pattern on a grocery store brown paper bag, guesstimated about how many blocks I’d need to make four stockings (14 blocks per stocking), took a deep breath, cut up my fabric, and started sewing. I reckoned I’d figure out the rest as I went along! 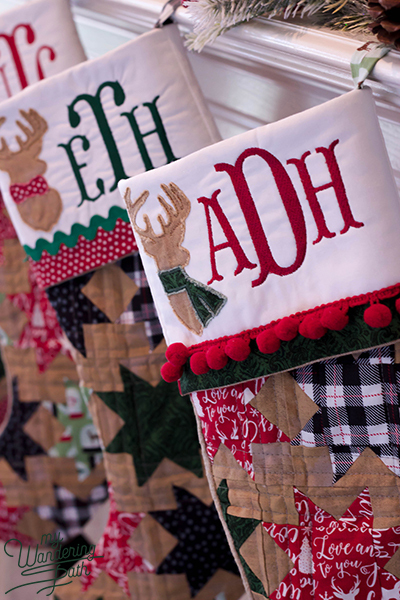 Fortunately, stockings are a pretty forgiving shape and there are great tutorials out there to help navigate the addition of a lining. Love the fabric, special touches, rustic and “home is where the heart is” look! Wonderful, creative job!